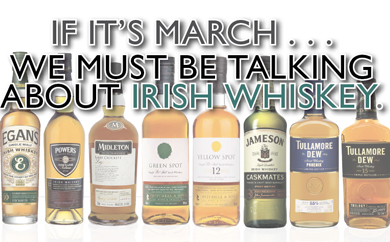 Try as it may, Irish whiskey cannot get away from the March Spike brought on by America’s obsession with St. Patrick’s Day. Sure, people drink more of it through the rest of the year now – the sales numbers are undeniable. But to many, the only time they ever get up the gumption to knock back a brimming glass of Hibernian nectar is the week around the Ides of March. Granted, there was a time when an Irish whiskey tasting event would have been like a milk tasting. ‘Welcome! I have regular, and low-fat and skim, and . . . er, chocolate. Yes, the same as we had last month. That’s all we have; all we’ll ever have, really.’ But nothing succeeds like success. As whiskey sales in general have taken off and Irish whiskey numbers have continued to climb at double-digit rates, there have been additions to the standard lines like Jameson, Powers and Tullamore D.E.W. (to use the company’s newly-preferred nomenclature), and a number of newer brands (or new to America): Glendalough, Egan’s, Green and Yellow Spot, Kilbeggan, and the growing line of single pot still bottlings from Midleton, among others. There’s a whole new array of labels on the shelf. Glendalough, a new Irish microdistillery from County Wicklow (see sidebar), has gotten a lot of attention in the Boston area, thanks to the energetic presence of Dónal O’Gallachóir, the brand manager and co-owner. “Dónal’s a nut,” laughs Nick Taylor, “he’s running all over the place, and the women love him. He’s such a riot.” He brings three poitíns and his Double Barrel whiskey, aged in bourbon barrels and finished in oloroso sherry casks. Jameson isn’t letting up, either. The parent company, Pernod Ricard, is continuing to roll out more of the single pot still whiskeys at the higher end, like the Powers John’s Lane and Barry Crockett’s Legacy, and the Green Spot and Yellow Spot whiskeys, previously available only in Ireland. They’ve also added the new Jameson Caskmates line, at a more affordable price for a whiskey upgrade. “We partnered with a local craft brewery in Ireland to create a Jameson whiskey finished in stout-seasoned barrels,” explains Jameson brand ambassador Greg Slattery. “The smoothness of Jameson complimented with new hoppy, chocolate and coffee notes from the beer has seen great consumer response to this new release from Jameson.” (There’s also a cider Caskmates that’s only available in Ireland, if you’re making a trip to Dublin.) He adds that there will be more releases in the single pot still portfolio this spring, but wouldn’t release more details yet. Tullamore’s bringing more new whiskeys as well. We got the excellent Phoenix limited edition, a blend of pot still, grain, and malt whiskeys finished in oloroso sherry casks and bottled at an unusually high (for Irish) 55%, according to Jane Maher, the Tullamore D.E.W. brand ambassador USA. She also has news about the forthcoming Tullamore Trilogy. So be aware. 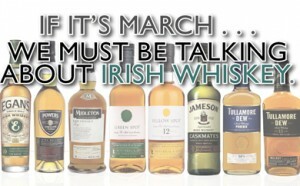 If you’re trying to sell Irish any month but March, even with the great new whiskeys, even with the excitement about whiskey, even with the wind of Jameson in the sails . . . you’ll still need a bit of luck. Just remember: a smart person makes their own luck. ALMOST ANY IRISHMAN over the age of 5O has a story that involves midnight money tucked in a certain cranny or crevice in the neighborhood, replaced in a few days with a bottle of clear – mostly clear – liquid to be taken back to your Da. That was poitín (‘pwauh-CHEEN’), the illicit liquor of Ireland, which has made its way onto the backbars and store shelves of Massachusetts. Don’t write it off as just another unaged “white whiskey”, either. “Poitín is the forefather of whiskey,” explains Glendalough’s Dónal O’Gallachóir. He traces it back to “584AD in Ireland, the first record of distillation for consumption. The word ‘poitín’ comes from a term for pot still – ‘poita’. ‘Poitín’ means what comes from your pot still. There are three Glendalough poitíns, all of which start at a serious 1O4.8 proof. The flagship is bottled at 😯 proof. There’s a golden-colored version that’s aged for a short time in sherry casks, and the Mountain Strength is bottles at a solid 1OO proof. “We like round numbers and things that catch fire,” Donal laughs.